Audit Log – Welcome! How can we help? 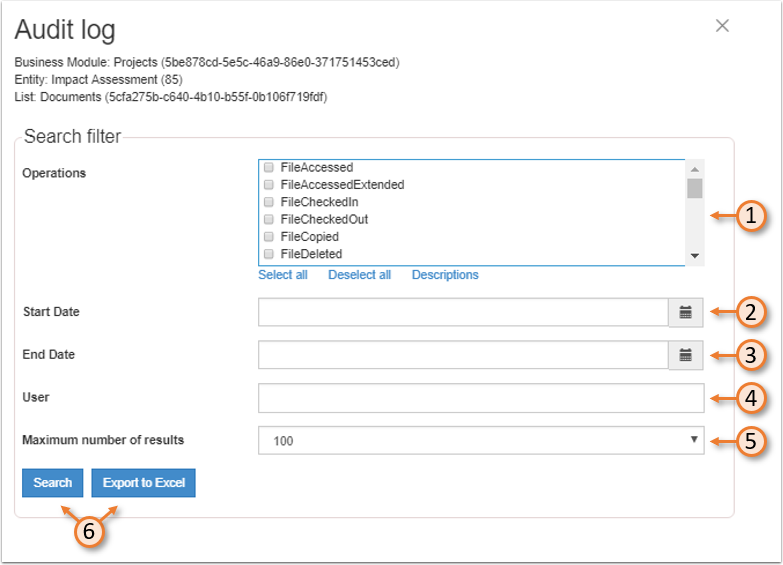 With this feature, WorkPoint extends the current audit log feature. 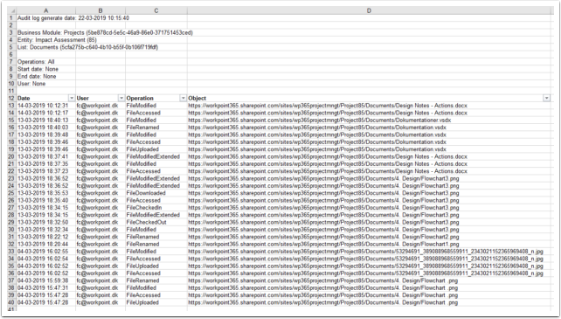 It records audit log data per document library. The log can be accessed through the action bar on any document library, but it will only be accessible to by people or groups already defined in the settings of the current functionality. 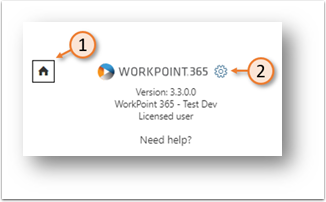 Note that this feature is only available in the Modern UI version of WorkPoint. There are several cases where this feature excels. One example is if a project manager wishes to see who of his project team has opened a specific document. Another case is if a project manager wants to see if a certain document has been shared with external people. A third example could be in a court case, if a company needs documentation that a specific external person has opened and/or downloaded a document. A fourth case could be that a project manager wants an overview of all changes made to a document library during a specific time interval. This needs to go into a report. He can then use the export-to-excel feature to cumulate the data into an easy to present spreadsheet. This is an additional feature. If you want to feature for your solution, please contact WorkPoint Sales by email at sales@workpoint.dk. Also note that this feature is only available for solutions using the Modern UI. Azure Storage is also required for this feature to work. What type of Azure storage is right for your company can be very difficult to determine beforehand since it can depend on many factors, such as number of sites. Please contact WorkPoint support for help regarding this topic. Only synchronization of “Replicate Settings” is strictly necessary in this case. For “User name”, type in the user name of the Service Account with access to the audit log. This user must have the “View-Only Audit Logs” role in Exchange Online. Set the interval for when the system will fetch data from the audit log. For performance reasons you should normally select the highest possible value (1440). These numbers represent minutes between each fetch. This determines the delay from an even occurring to its visibility in the audit log. 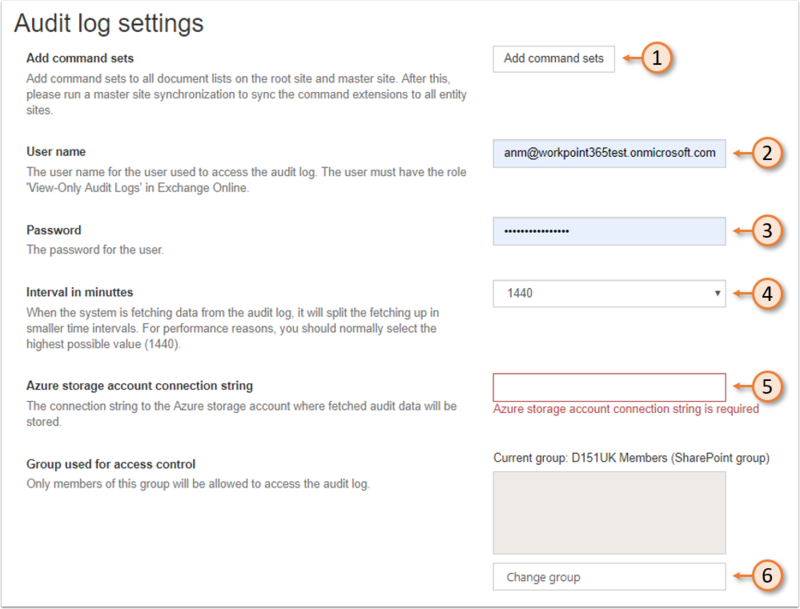 The connection string to the Azure storage account where fetched audit data will be stored. Only members specified in this field will be allowed access to the audit log. Followed by this is a long list of queries that can be activated. These are the kinds of data that you want the log to record. You can tick the ones that you want the log to record on and tick off the ones that you do not need. A list of the queries and their technical descriptions can be found be navigating to this link: https://docs.microsoft.com/en-us/office365/securitycompliance/search-the-audit-log-in-security-and-compliance. Once done setting up the Audit Log, click “Save” at the bottom of the interface. Then click the “Add command sets” button in point 1 of the image above. 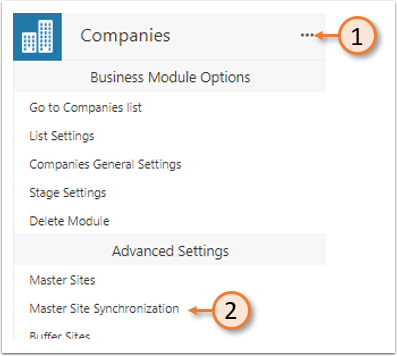 From the WorkPoint 365 Administration, click the header of the business module for which you wish to run a Master Site Synchronization. In the Master Site Synchronization interface, click “Synchronize all”. This process may take some time. The process can be follows by refreshing the list below these buttons by clicking the “Refresh” button. This kind of search and export can be done both on a List/Library level or on individual documents. Note that all the same audit log event as before will be recorded. The log is available in the same UI as the past audit log. Also note that using the audit log will include a certain delay. Microsoft states that their audit log (from where we fetch the information) can be delayed with up to 30 minutes. 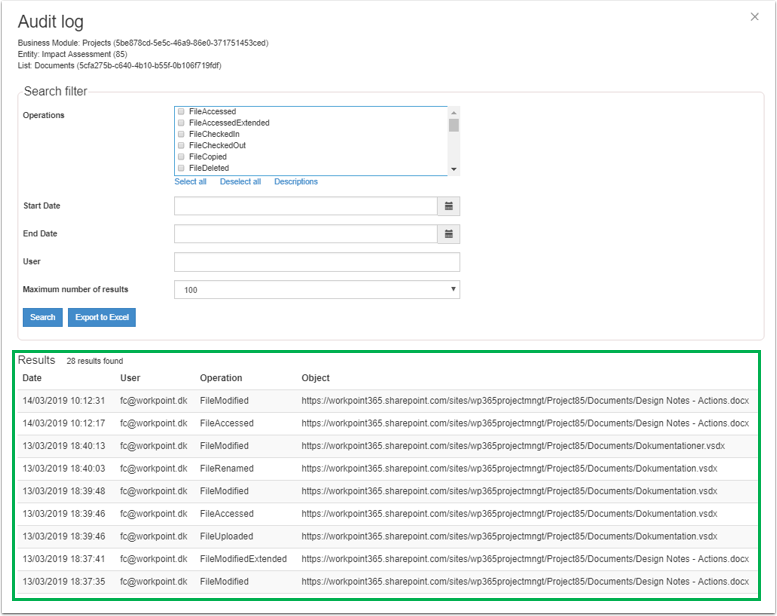 Further, a WorkPoint job will run every hour (minimum interval) to fetch the information from the SharePoint logs and added this to logging database in WorkPoint. So it should be expected that this kind of information is delayed with up to 1½ hour plus any overhead time regarding processing the audit logs (e.g. If lots of documents are changed within a short period of time, it can take some time to process this information and store the information in the WorkPoint logging database).